Soups and chili are some of my favorite meals, fortunately, my family loves them too! 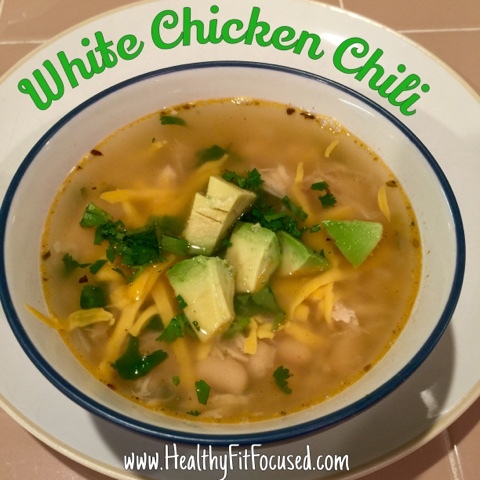 My mom used to make White Chicken Chili all the time growing up but I forgot about it...so I dug out the recipe and decided to spice it up a bit! I had a whole chicken that I needed to use, and I love the homemade broth that it makes. So today, I boiled my whole chicken to make the broth to use for my chili (broth and chicken)...Deboned the chicken and strained the broth!! But...you don't have to use the chicken like this! Cook chicken fully. I like to sauté onions and garlic before adding to chili. Add all ingredients together, let simmer for at least 20 min or until hot. This is also a great crockpot recipe. Cook this up and let it cook on low for the day! Top with fresh cilantro, cheese and avocado!